On an Internet facing SharePoint site you want to enable anonymous access so your visitors do not need to authenticate against your membership provider. 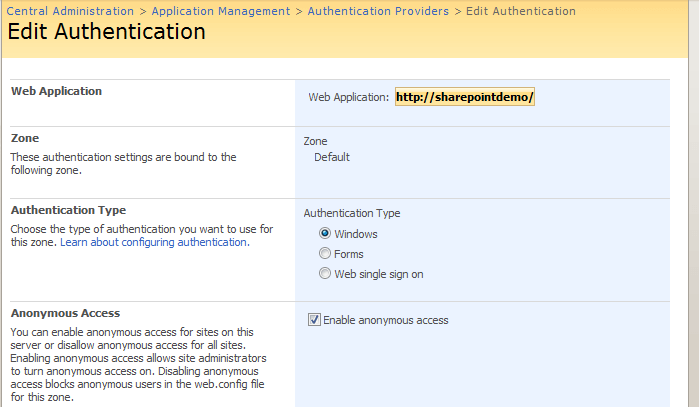 There are two things you need to do to enable anonymous access on a SharePoint site. Firstly you have to configure your membership provider via SharePoint Central Administration then you enable anonymous access on the site. 1. Browse to your site, select Site Actions -> Site Settings -> Advanced Permissions. Select Advanced Permissions. 2. Click Settings and select the new option in the menu, Anonymous Access. Select Anonymous Access. 3. Select your required setting, probably Entire Site and click OK. Your SharePoint site will now allow anonymous access and not prompt for authentication.